Introducing Daikin’s intelligent Touch Manager, a VRV system controller with a array of simple, useful system management functions that give you ultimate control over your entire air-conditioning network from an easy to use, programmable touch screen interface. Intelligent Touch Manager lets you control up to 64 indoor unit groups out of the box, or up to 512 with multiple optional adapters. Through the intelligent Touch Manager (ITM), you can now control all Daikin VRV, Sky and RA products simply and conveniently. Each ITM is equipped with a single DIII Net port that enables control over 64 indoor unit groups and up to 10 outdoor systems. For larger HVAC projects, intelligent Touch Manager's capacity can be increased through the addition of the ITM plus Adaptors. Each ITM plus Adaptor enables a further 64 indoor unit groups and 10 outdoor systems to be added to the ITM control interface, bringing the total system capacity up to 512 indoor unit groups and 80 outdoor systems. To enable the control and monitoring of ancillary devices such as lights, fans, pumps etc. Daikin’s ITM utilizes the Wago I/O system. The versatile, compact and scalable nature of the Wago I/O system complements the Intelligent Touch Manager for comprehensive control of your building’s air-conditioning requirements. Handy area settings simplify detailed management of VRV. Floor plan display enables a quick search of desired air conditioning units. Operation history shows manner of control and origin in past operations of air conditioning units. Remote access via a PC allows total air conditioning management using the same interface as the intelligent Touch Manager itself. Authorised users can centrally control individual air conditioning units from their own computers. VRVs are controlled automatically throughout the year by the schedule function. 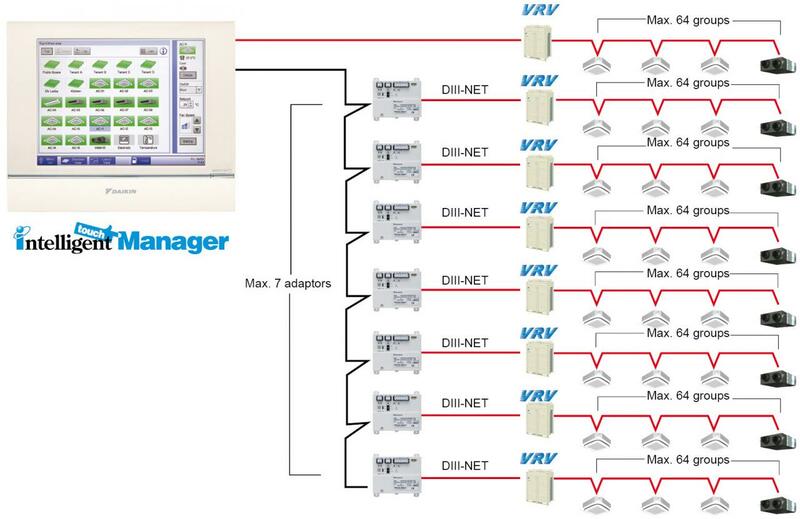 Interlocking VRVs and other equipment enables easy automation of building facilities operation. Setback adjusts temperature settings even when rooms are unoccupied. Designed to automatically change the air conditioning system setpoint at building entrances to reduce differences between the outdoor and indoor temperatures, virtually eliminating “heat shock” when entering a building and improving overall energy efficiency. The Energy Navigator feature simplifies energy management by tracking energy consumption data and identifying inefficient operation. Contact information of maintenance contractors can be registered and displayed. E-mails are sent automatically to alert of malfunctions and potential trouble. 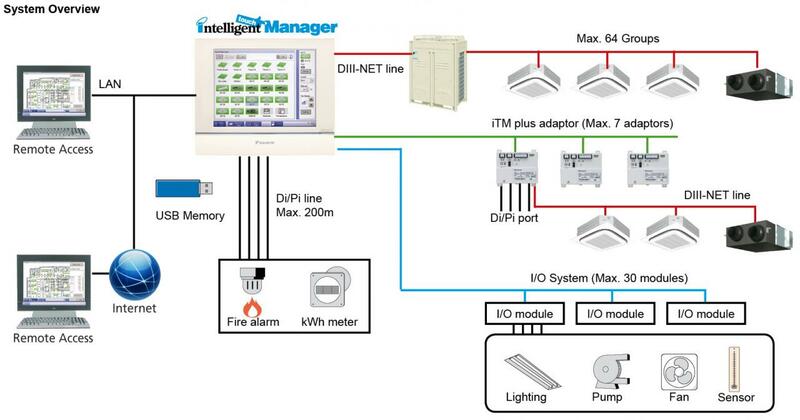 The intelligent Touch Manager can link to the Air Conditioning Network Service System for 24-hour monitoring of operating conditions and status. A single intelligent Touch Manager can manage a small building or be expanded to handle medium to large-sized HVAC applications. Large building properties can also take advantage of the iTM integrator to link up and expand system up to 5 intelligent Touch Managers for integrated control. Advanced interlock control extends beyond simply starting and stopping interlocks to manage automatic interlocks of connected units, for control of complex operations like free cooling and time-delayed ventilation. Intelligent Touch Manager can also manage your Ventilation Control, monitoring CO2 levels and controlling ventilation equipment to maintain both air quality, and system efficiency. Intelligent Touch Manager can be configured to use key control systems and occupancy sensors to detect when a room is unoccupied and automatically perform setback or stop operations. Download the latest iTouch Manager Product Brochure for more information.